In their latest caper, four young sleuths (counting the hamster) not only uncover a hidden treasure, but foil its theft. 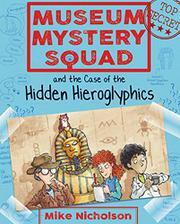 Edinburgh museum director Magda Gaskar summons the Museum Mystery Squad—narcoleptic genius Laurie Lennox, quick thinker Kennedy Kerr (both white), and tech whiz Mohammed “Nabster” McNab (evidently a Muslim Scot)—to the museum’s Egyptian Zone to watch (supposed) Egyptologist Peter Gyptex at work. (Colin the hamster consults from his cage at home.) They arrive just in time to see some newly exposed “hieroglyphics” (actually rebuses) on a pharaoh’s casket that turn out to lead to a long-lost jeweled bracelet. Piecing together sharp observations, solving anagrams, and learning bits about ancient Egyptian burial practices and hieroglyphics (“A bit like telling a story using only emojis, no words,” explains Kennedy vividly if inexactly), the MMS winkles out the bracelet’s hiding place just in time to nab the “expert,” who turns out to be a wanted thief with a penchant for disguises, as he’s trying to sneak it out of the building. Nicholson slips in fact boxes and a miniquiz as well as some red herrings to confuse matters. Phillips adds coded messages, screen shots, and diary pages to cartoon views of the squad in action. A final word-search puzzle (with answers) serves as both brain teaser and review. Companion adventure Museum Mystery Squad and the Case of the Moving Mammoth publishes simultaneously.